Liverpool publisher Bluecoat Press are building up a great collection of titles showcasing British photography, particularly “books about photojournalism and documentary photography, with a particular emphasis on British identity“. One I know I’ve written about in the past was Paul Trevor‘s Like You’ve Never Been Away and I also mentioned Trish Murtha‘s Elswick Kids and her Youth Unemployment. Another volume, not yet listed on the Bluecoat Press site, but like these funded by a succesful ‘Kickstarter’ campaign (it ended in September 2018) is Rob Bremner‘s ‘The Dash Between‘, with portraits he took on the streets of Liverpool in the 1980s, which, as the Liverpool Echo headline says “captured the true heart of 80s Liverpool“. You can see a fine collection of Bremner’s images on his Instagram page. 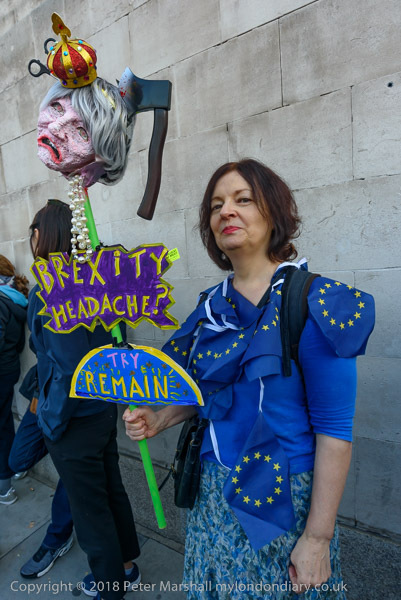 The march calling for a ‘People’s Vote’ now that the issues around Brexit are clearer was one of London’s largest, although the actual numbers present are disputed. 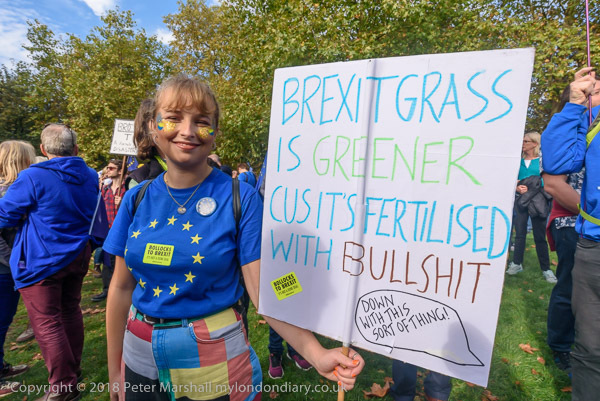 But while the rally was going on in a packed Parliament Square there were still people waiting to leave Park Lane, around 3km away, with others in Green Park, and the march still sttretching along the entire route. 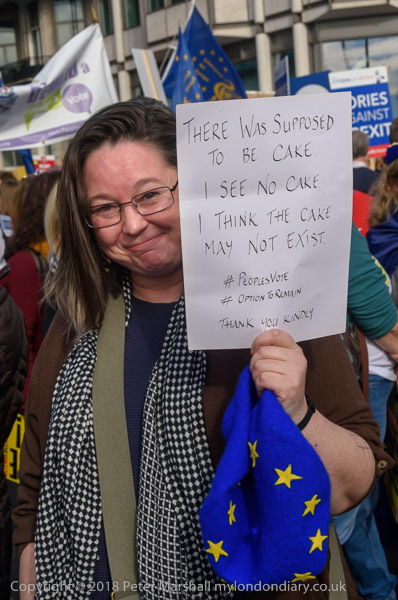 Noticeable as well as the sheer numbers was the huge range of posters and placards that people had made for the event, some short and direct, others considerably more creative, but overwhelmingly individual, father than the uniformity of some political protests. In this post are a few of my favourites, which I’ll let speak for themselves. 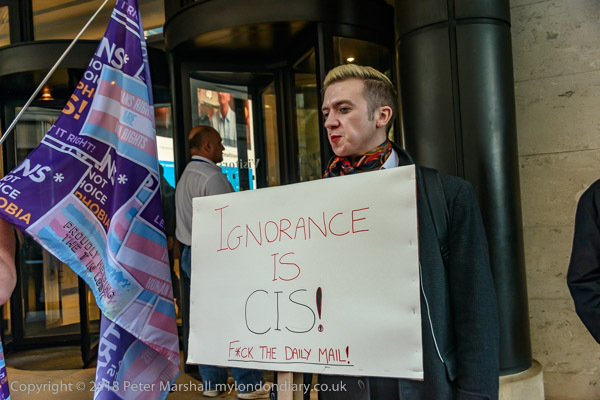 People came to the Daily Mail to protest against papers in the Mail group, including the Metro, Daily Mail and others publishing articles demonising trans people, particularly trans women, and in particular the publication of an advertising campaign by campaigning group ‘Fair Play for Women’, which they see as a hate group. 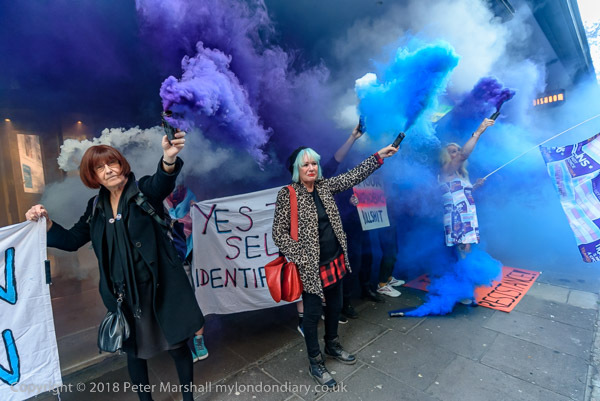 A small group of mainly older feminists have come out violently against the right of trans women to be considered as women; they have been labelled as ‘trans-exclusionary radical feminists’ and have published articles, picketed and protested at events against the inclusion of trans women as women, and of the right of trans women to identify themselves as women. 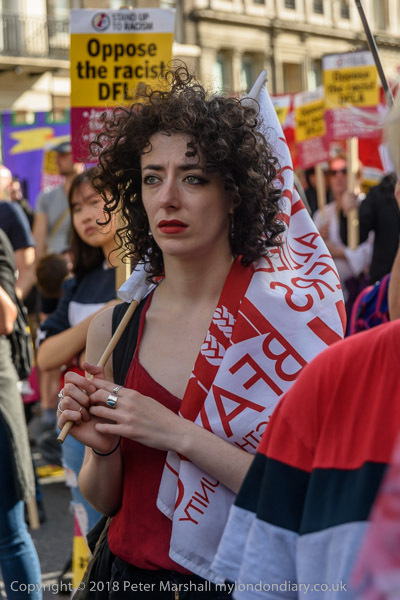 Many other feminists and those in sympathy with the feminist movement view them as extremists who are denying trans people their human and civil rights. 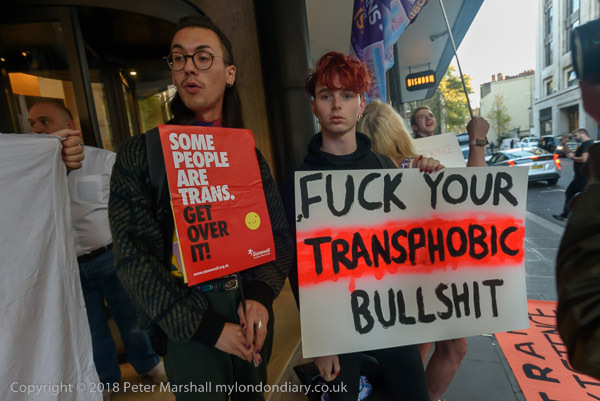 They accuse the ‘TERFs’ of hate speech, while the anti-trans group say that the term TERF is itself hate speech. 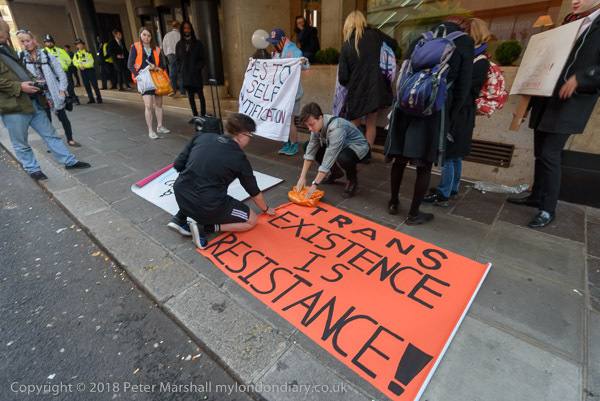 Having several trans friends, I find the prejudice against them and the denial of thir problems and rights hard to understand and impossible to tolerate. 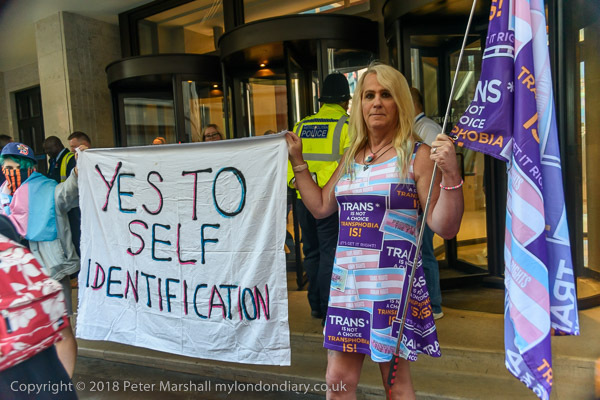 As the poster says, ‘Some People Are Trans. Get Over It‘. And while I might not share the language of the other poster below, I rather endorse its sentiment. As the posters at this protest illustrate, feelings over the issue run high, and there have been some violent clashes between the two groups, disrupting some events. Photographing the setting off of flares by the protesters as usual presented some propblems. At first I was too close to the protesters, at the right of the picture above, in the direction the coloured smoke was blowing. Everything went blue and it was had to see anything. 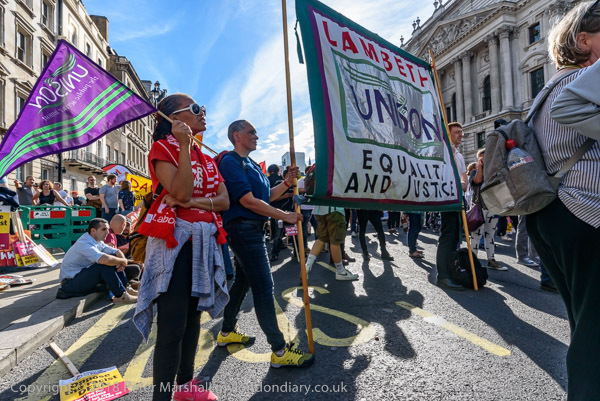 I quickly rushed around and moved slightly further away from the protesters to take the picture above, and several others, moving in slightly closer to concentrate on particular women. Smoke flares soon burn out, and I didn’t quite manage to do all I wanted to, but I was fairly pleased with a couple of the images. My walk from Stratford to Old Ford was not planned but rather on the spur of the moment, realising that I had several hours to fill between photographing BEIS refuse International Rescue help at lunchtime in Westminster and going on to my next event outside the Daily Mail, and that the weather was fine, with sun and a clear blue sky. I set of knowing which way I would start but with no particular destination in mind. 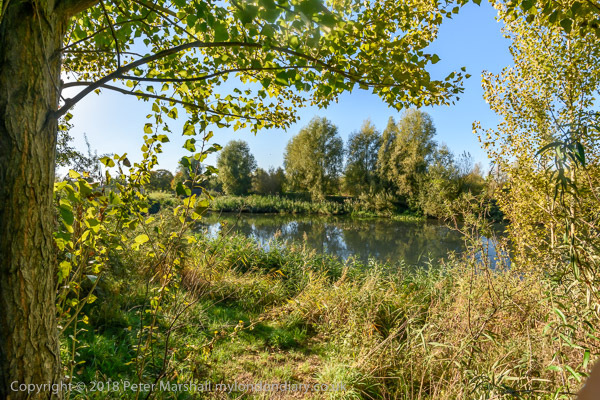 I’ve been interested in the Lower Lea Valley since I first walked there in around 1980, that led to my web site ‘The River Lea’ and later the book ‘Before the Olympics’ which I think first came out in 2011 and is still available. 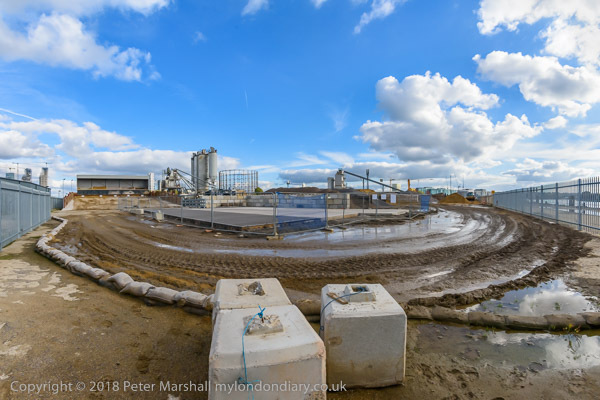 At first I was very much attracted by its mixture of industry and post-industrial wilderness, particularly around the Bow Back Rivers between Stratford and Hackney, the very area that later became the Olympic site, and much of which is now a huge park. 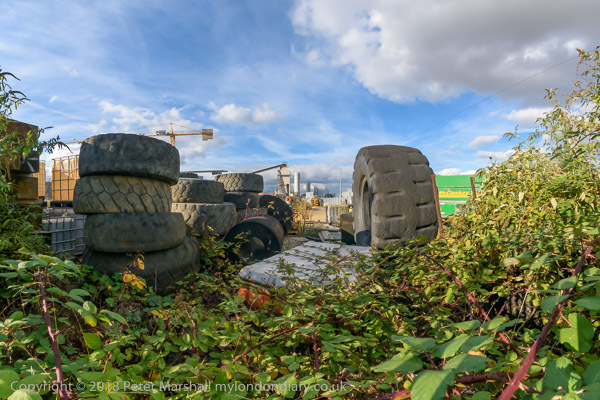 On earlier walks I’ve found this empty and alienating, but on this walk I was exploring one of the wilder areas, which was a welcome relief after walking through the urban hell of Westfield. 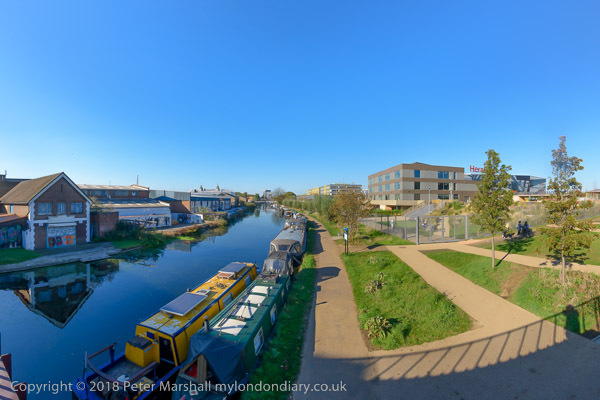 Coming out from these wetlands you still have to cross the arid desert that occupies much of the new park, before crossing the Lea Navigation into Hackney Wick, which is a far more lively place. 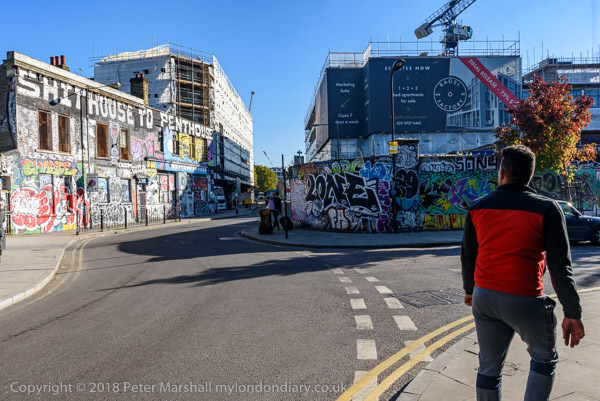 Tidied up for the Olympics, with much of the more vibrant graffiti removed, Hackney Wick is now in a rather curious balance between artistic ferment, peak hipster and gentrification. 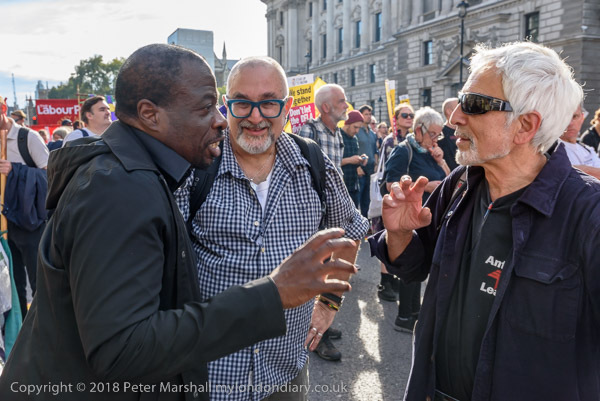 As you can see from the full set of pictures and text on My London Diary, I wandered rather, and found myself having to rush to get to my next event. You can see more pictures and text at Olympic Park walk. Every few months I go out with a few photographer friends for a few drinks and a meal, and sometimes we take a few pictures too, though it is really more of a social event. 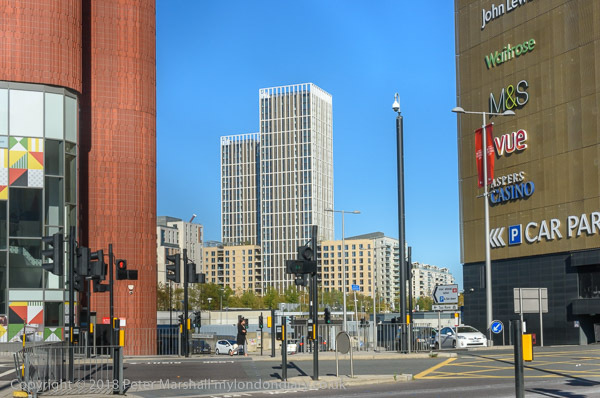 But in October our walk was rather different, partly because it was a prelude to attending a book launch by another of our group of friends, Mike Seaborne, taking place that evening in the Isle of Dogs. 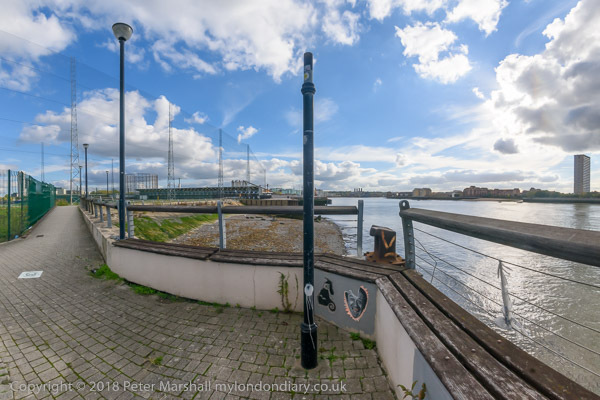 I’ve a long relationship with the riverside path at Greenwich, one of my favourite walks over the years, beginning back around 1980 when the area was highly industrial. 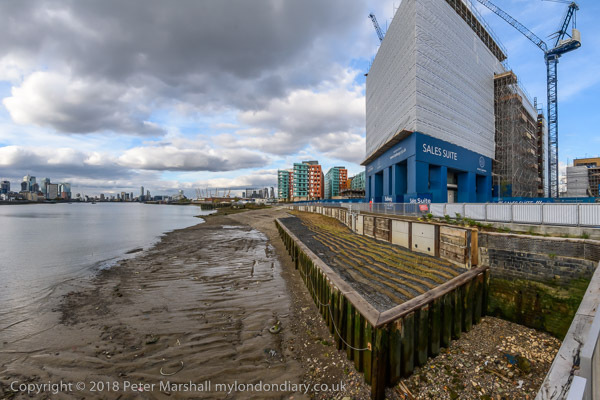 In recent years there have been closures of parts of the path where riverside flats were being built, but the last part re-opened just a few weeks before we walked it, and with this in mind I proposed we meet at North Greenwich station and walk into Greenwich. 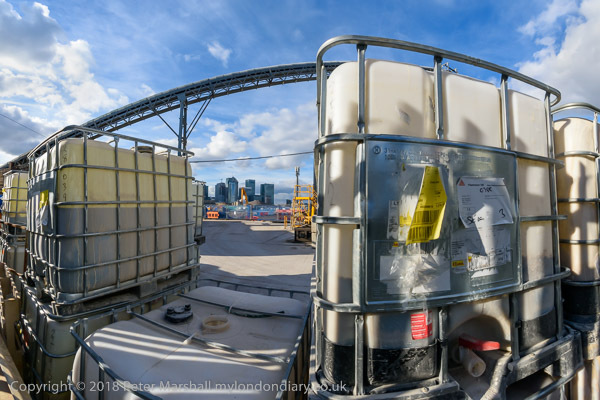 Mostly I was interested in taking panoramic images and all of those shown here have a horizontal angle of view of over 140 degrees and a vertical field of view of just over 90 degrees and are in the normal 35mm 1.5:1 aspect ratio. Occasionally (usually by accident) I take them in 16:9 widescreen ratio which my Nikon D810 defaults to if you go into Live View in movie mode even if you are taking still images. Often I crop them to more panoramic format, typically 1.9:1, which is equivalent to using a rising or falling front on the camera. For landscape images it is generally vital to keep the camera level to avoid a curved horizon, and the D810 can display both up-down and left-right level indicators. Lightroom by default corrects fisheye images to rectilinear perspective if you use the lens profile, which is frankly nonsensical. Fortunately it is possible to edit the profile to give no correction. In converting to rectilinear it throws away most of the image and gives you a fairly normal wide-angle view. Rectilinear perspective can’t really handle angles of view greater than around 90 degrees as I found using a 12-24mm lens. For most subject matter anything shorter than 16mm (97 degrees horizontal) was hardly usable, and I was very seldom happy with pictures I took at 12mm (113 degrees.) The 147 degrees of these images is simply out of range. Very occasionally I’ll take a picture with this 16mm lens (or its 10.5mm DX equivalent) which looks fine exactly as taken, but for most scenes I’m thinking as I take it of a rectangle not quite as it appears in the frame, but defined by the centre of each of the four sides of the frame, knowing that I will lose the four corner areas. This is I think a ‘cylindrical’ perspective, exactly like I made for around fifteen years with a succession of ‘swing-lens’ cameras, where the lens rotates around the centre of a part circle of curved film, typically giving images with around a 130 degree angle of view. 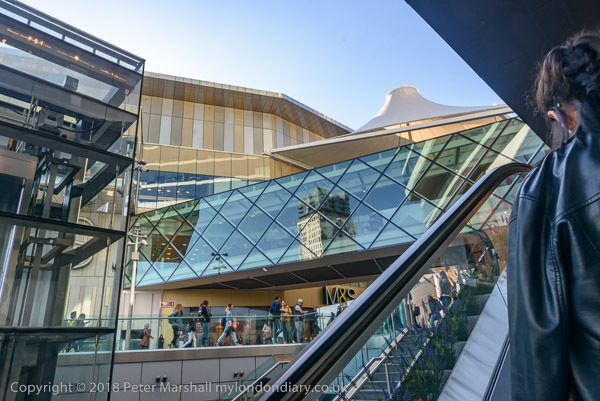 There are quite a few software programmes that can perform this conversion, including both freeware and hugely expensive panoramic imaging software (which can of course also combine a number of images.) When I wrote for money on the web I was able to test a wide range of these, money no object as they came free (though sometimes time-limited.) They all did simple jobs like this well. I’ve ended up using Fisheye-Hemi, now sold by Imadio simply because of its convenience as a Photoshop plugin (it also works with other software which can use Photoshop plugins.) Recently I’ve upgraded to the latest version which is a Lightroom plugin, even more convenient for my workflow. I now don’t get offered free software, but this isn’t hugely expensive, though a weak pound doesn’t help. 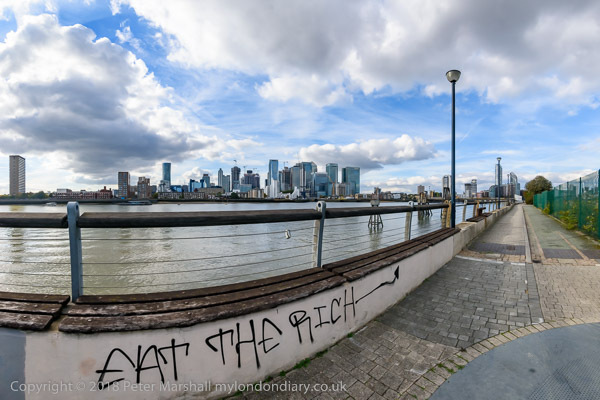 You can see these pictures (a little larger) and more – both panoramic and normal rectilinear – on My London Diary at Greenwich Walk. Our walk ended at the Pelton Arms which has a good range of real ales and is less of a tourist attraction than the riverside pubs. If you are readling this on the day it is posted, unless the weather is really foul, I’ll be out and walking off a little of that extra Christmas food today. I read a post a week or two ago, pointed out to me by an anarchist friend, on the British Culture Archive web site, posted there last March, Anarchists & Underdogs | Images of Social & Political Graffiti in the UK and as well as sharing the link with you, thought there were also a few images I took in the 1980s of similar material. It was one thing thinking that, but since I had no real idea of when I might have taken the pictures they were not that easy to track down. I’ve never really concentrated on taking pictures of graffiti, though in more recent times I have photographed some of the more colourful images on walls in Leake St underneath Waterloo Station, a route a sometimes detour through when I’ve just missed a train home and have 22 minutes to wait for the next, in Shoreditch, London’s graffiti capital, and elsewhere, not forgetting Hull’s great Bankside Gallery. 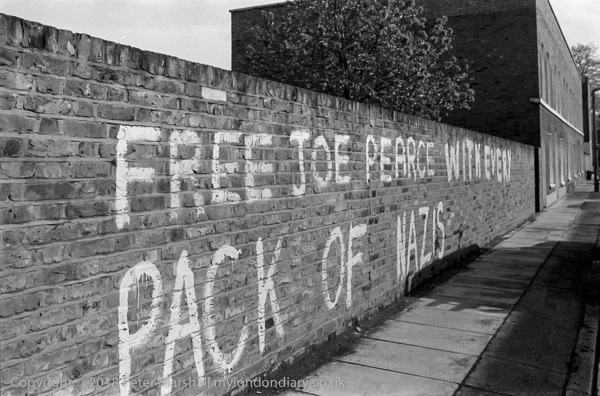 But these are more murals than graffiti, and the earlier examples, both in the BCA article and here are simple text statements, usually of a political nature. 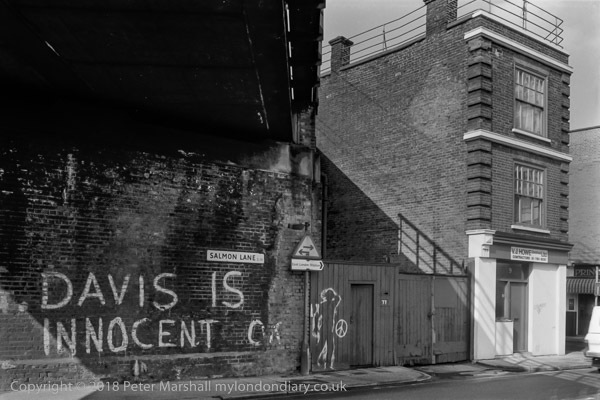 ‘George Davis is innocent, OK’ appeared on walls across London, and is one I’ve written about before, though I can’t remember where. It was so common it hardly seemed worth using film on, unless there was a little more to it. Of course he was probably innocent of this one particular charge but otherwise a prime villain. Police had deliberately held back evidence that would have led to his acquital and the identification evidence was unsound and the huge campaign over his sentence led to early release in 1976 although the conviction was only finally quashed in 2011. Many of us knew that such things happen – and I was later openly threatened with being “fitted up” by a police office back in the 1990s – but the George Davis case brought it out into the open in a way that hadn’t happened before. But what made me photograph this particular instance was the anti-nuclear figure with a CND symbol next to it and the location. 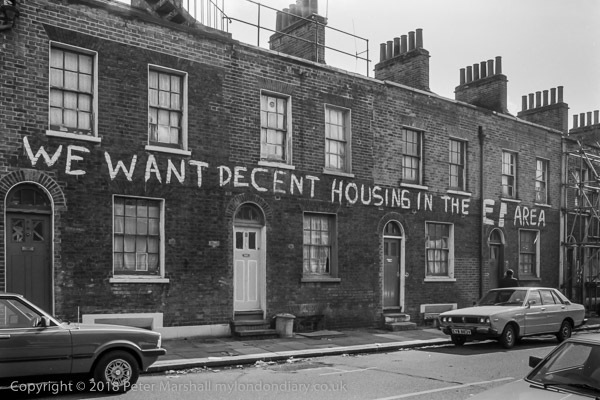 I didn’t even feel it necessary to include all of the G.
Housing was an issue back in the 1980s as it is now, with London Councils being accused of racism and social cleansing. Of course things have changed. 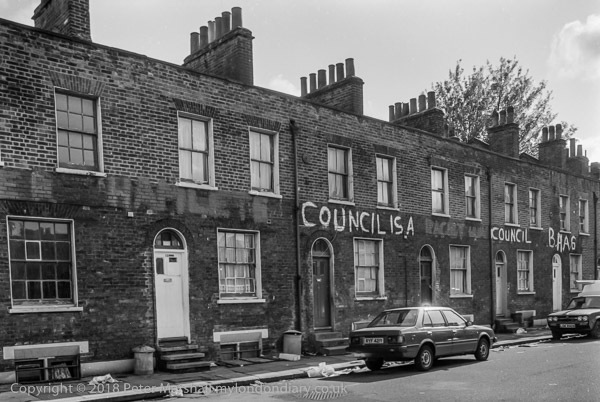 Then the councils were building council housing – if not always doing so in a way that really met local needs, and clearing largely privately owned slums, often in very poor condition, though some were structually sound and could better have been refurbished. 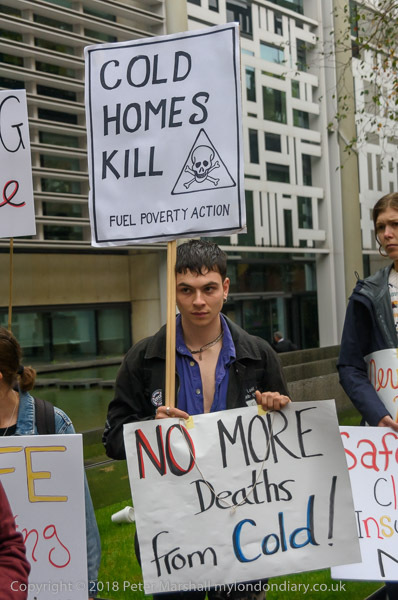 Now they are working with property developers to demolish council estates and build properties almost entirely beyound the means of the council tenants who are being displaced by the new developments and mainly for private sale at market prices, under the banner of ‘regeneration’. Tower Hamlets, traditionally Labour, came under Liberal/SDP control days before I took this picture by a majority of twoin a low (35%) turnout. 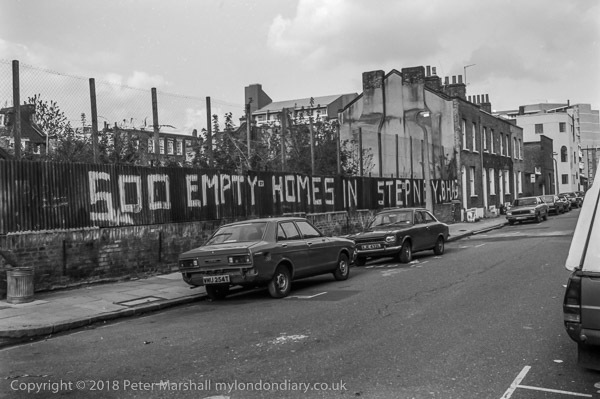 I took all of these pictures in London’s East End in May 1986. And this is the picture on the Christmas card I physically gave to just a few of my close friends. It looks a little better on-line as I was having printer problems when I had to produce it. I’m not actually writing this on Christmas Day, as I’ll be too busy, but I’ll schedule this to be published. It’s one of the few days in the year I usually go to church – for years Sunday was always a day for taking photographs, and it still is at times. But we’ll have something of a family day and I’ll be helping getting dinner ready for it and then relaxing afterwards. 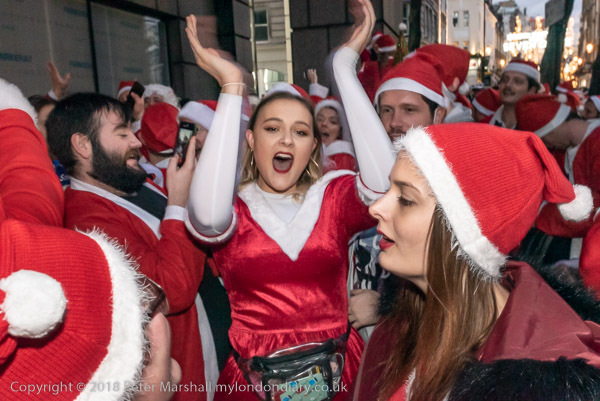 The advantage of an online greeting is that you can see a few more of the pictures I took when I chanced to come across this year’s Santacon in London. 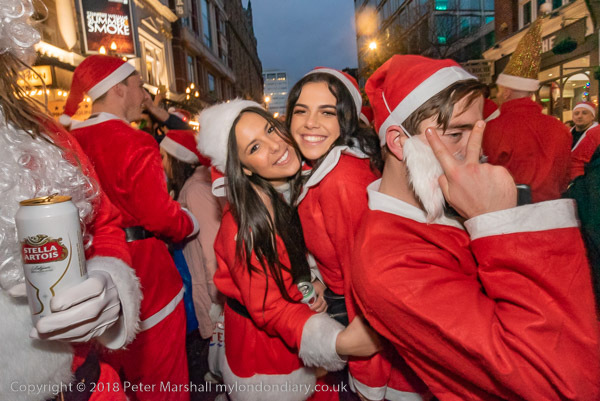 Of course I knew that Santacon was taking place, but hadn’t bothered to find the places and times, and just happened to walk down one of the right streets at the right time, intending to get on a bus on my journey home. There were elves as well as Santas, and the occasional reindeer. and music and dancing. We do the music at home at Christmas, but I don’t think our rooms are large enough for much dancing. Although I don’t much like using flash it adds something to the interaction with people in pictures like this, though it also needs quite a lot of work – burning and dodging – to even out the light, particularly when scenes includ people very clost and at a distance from the flash. 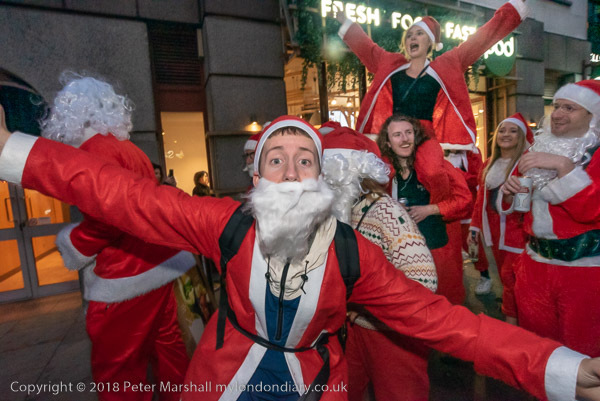 I stayed working with the santas as they made their way from High Holborn down to Trafalgar Square, with rather a lot of stops for dancing and crowding around cars and other harmless fun. 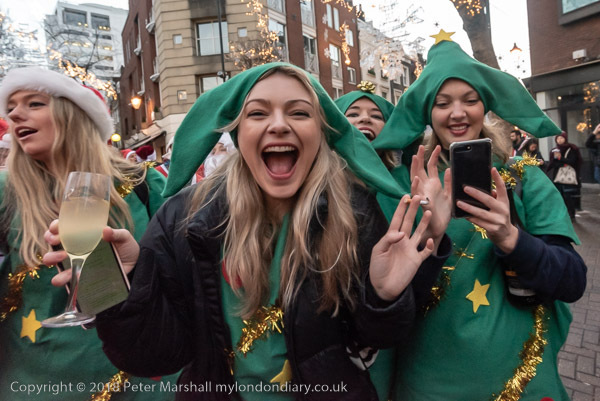 You can see many more pictures on My London Diary at London flooded with Santas. Again I’ll wish you all Happy Christmas! I’ve been fortunate always to have had a roof over my head, though it hasn’t always been a comfortable one. A few of the places I lived in as a student were beyond grotty and one I had to leave after a week it was so desparate. The bed bugs were the final straw. The room I moved into certainly wasn’t palatial, but it was at least clean and the walls weren’t running with damp. The rent was a little more, but it was reasonably warm and safe, in a house where the owner, my landlord lived. I’ve lived in some cold places. Back in 1963 in a viciously cold winter there was a month or two where the bathroom never got above freezing and I never had a bath, and in Leicester the ice was thick inside the windows and I gave up shaving – and never started again. In Manchester, where we lived on the top floor of a small terraced house, there were slotmeters on the landing for gas and electricity, and the landlord came and emptied them. We were paying three or four times the going rate. We went out and bought a paraffin heater. It was smelly but got our room warm – and the condensation from it brought the wall-paper off the wall. Everything changed when I got a job in a new town – and a large new flat at council rent with a hot-air heating system run on off-peak electricity, and we lived in comfort for several years before buying a house of our own. 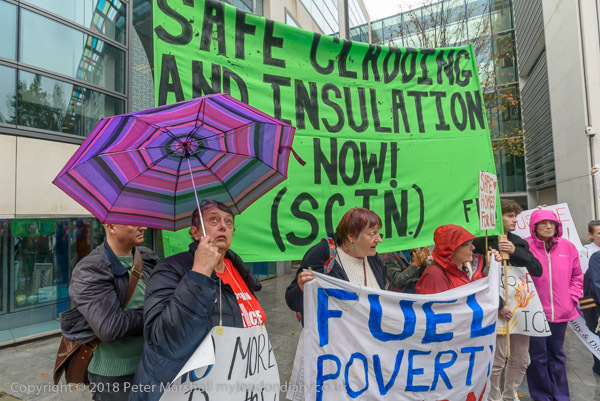 We wanted to move and it wasn’t possible to remain in social housing. We moved into a small victorian semi which was cold and draughty and which had hardly been modernised since it was built, other than having the gas lighting replaced by electricity – though some of the piping was still there. We were fortunate that we could afford to replace the old draughty sash windows with double glazing. I spent hours fitting draught-proofing, putting insulation in the loft and on the inside of front and rear external walls behind plasterboard fixed to battens. The exterior walls were just a single brick thick – which didn’t stop people trying to sell me cavity wall insulation, though there was no cavity. We had gas fires put in rather than central heating as it was more energy efficient but it remained a rather cold house, though much better now since we had external insulation on the gable end a few years ago. We were fortunate that we owned the property (though it took 20 years to pay off the mortgage) and could make it warmer – and that we could afford to do so – with the help of government grants to meet part of the costs for a new roof and, many years later, external insulation. And that we had enough income never to have to make the choice between turning on a fire and eating. When we were in private rentings things were much tougher. I spent a year in a tower block too, on the 10th floor about half-way up. But fortunately it wasn’t covered in highly flammable material and didn’t catch fire. The worst that happened was broken down lifts. 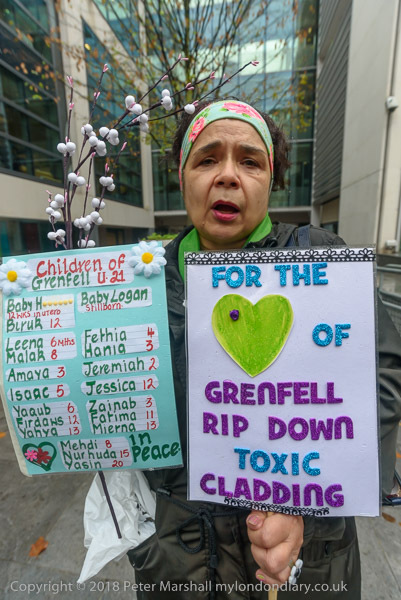 But there are still many blocks with the same dangerous cladding that was used at Grenfell, and probably also applied with much the same disregard for proper support and breaks; not really accidents but tragic fires waiting to happen. 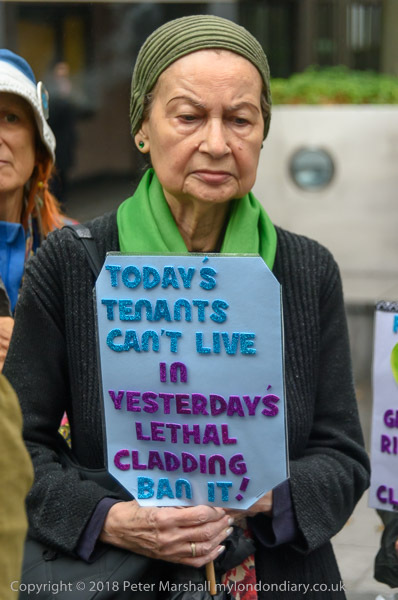 We need new laws – like that the Conservatives – many of them landlords – voted down to ensure that properties are safe to live in. And for governemnt to keep the promises it made just after Grenfell. To bring in proper and regular fire safety checks, to ensure that building regulations are adhered to – and toughened where neceessary. To remove flammable cladding from all tall buildings, to reverse cuts in firefighters and fire appliances and so on. 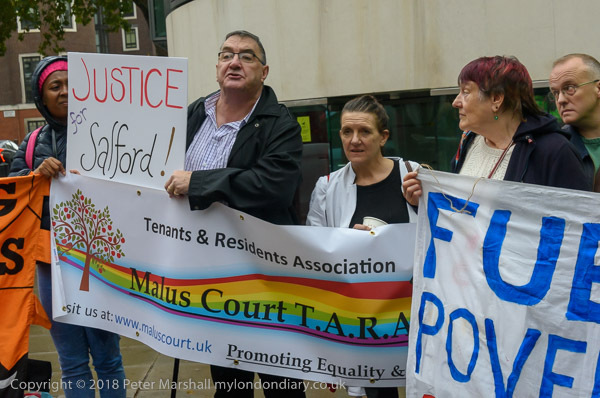 To listen to the complaints of tenants and take action, and to end evictions of those who complain or ask for repairs of private rented properties. And of course to build much more council housing and end the demolition of existing council estates. In my twenties I was a housing activist, part of the Moss Side Housing Action Group, trying hard to persuade the city council to build homes that people wanted and would last. We wanted safe, decent housing – and they built instant slums, now largely replaced. People deserve good housing – and the cheapest way to provide it is council housing. Rents are much lower not as many think because of subsidies, but because it is more cost-efficient and most council estates have more than paid for their costs in a reasonable time-scale. 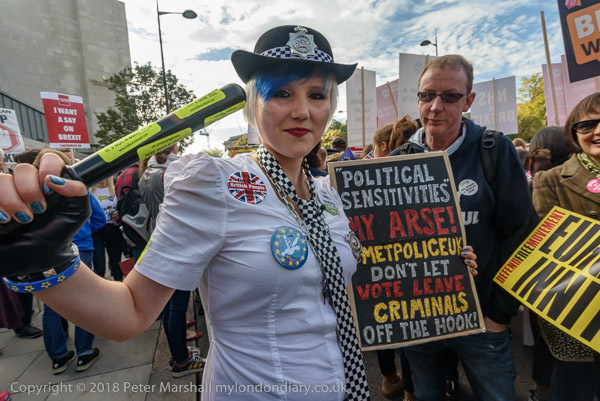 I’ve not written anything here about the actual protest, but you can read that in the text and captions on My London Diary. Further Education has often been discribed as the ‘Cinderella of Education’, and it is still sitting in the dirty fireplace, with no sign of a fairy godmother, ball or glass slipper. It remains terribly unfunded compared both with schools and with the more glamorous ‘Higher Education’. 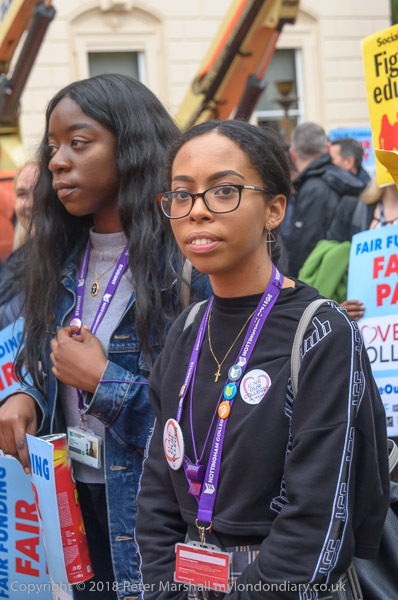 As well as colleges being strapped for cash, students have also suffered, particularly with the withdrawal of maintenance grants in England. 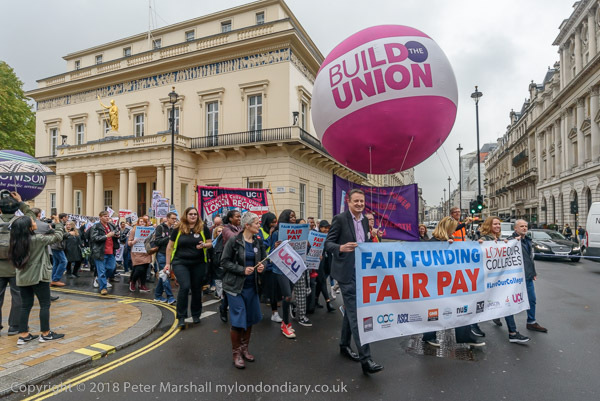 The march was a part of the ‘Love Our Colleges’ campaign week of action and was followed by a rally which I didn’t photograph, as well as a lobby of Parliament. 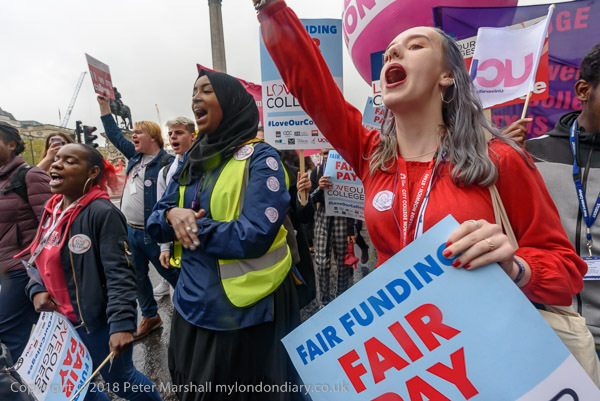 FE colleges have long been a vital part of our education system, and many were founded because of local needs and have very strong community links. Years ago many were a matter of fierce local pride. Some of these gradually took on more and more higher education courses and have transitioned to become universities, but FE remains vital for training at lower levels and in particular for 16-19 year olds. As well as providing the kind of academic courses available in school sixth forms they also offer a wide range of more techinical and vocational courses. 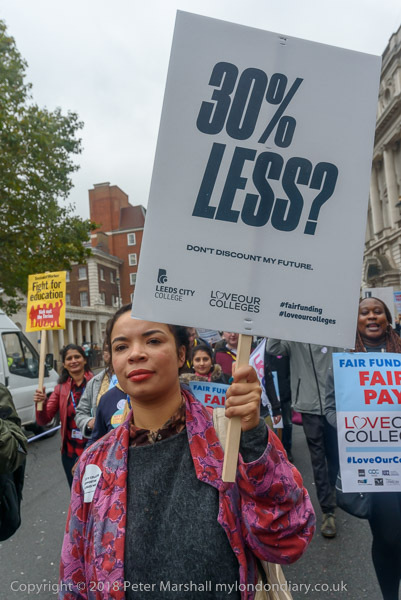 The future of FE colleges is under threat as funding has been cut by 30% since 2009, meaning young students get fewer hours of teaching support and a huge reduction in learning opportunites for adults. The value of staff pay has falling by mnore than a quarter and they now get £7000 a year less on average than school teachers. 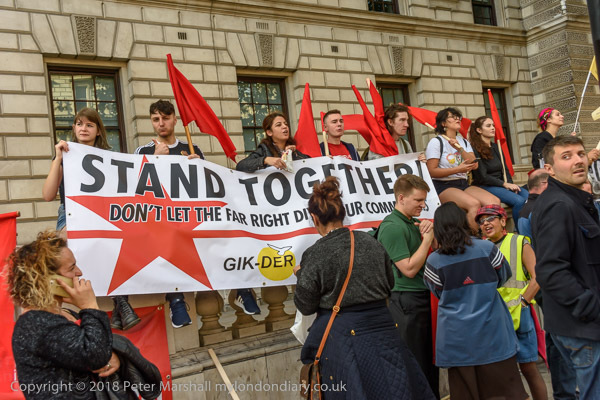 There were two events in London opposing what the organisers of this event, Stand Up To Racism and Unite Against Fascism, described as “a demonstration for bigots and Islamophobes in London “by the racist ‘Democratic’ Football Lads Alliance (DFLA)”. It wasn’t a huge rally, though rather more supporters than on the previous similar occasion, and with a better sound system which this time police had allowed them to put in place – at the earlier protest police had blocked them bringing it. 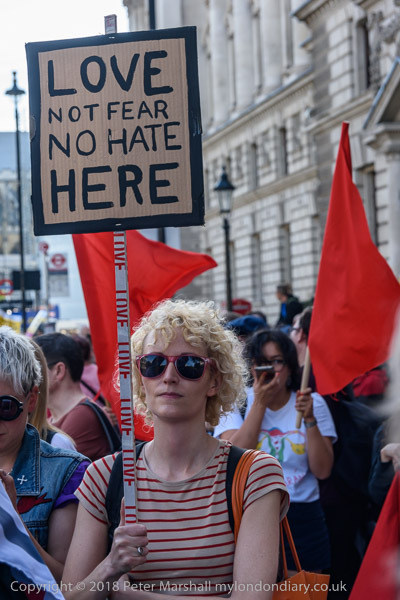 This time the police seemed more concerned about facilitating their protest rather than obstructing it, and at keeping out the handful of racists who came to try and disrupt it. 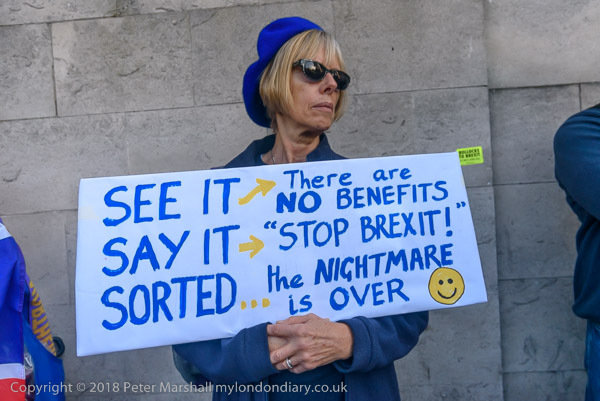 After taking some pictures of the rally, I went back into Parliament Square to sit down and eat a very late lunch of the sandwiches I had brought with me. I usually bring sandwiches when I’m working across the middle of the day, often eating them in the middle of protests. Of course you can buy food in London, but not always conveniently and seldom really suited to my dietary requirements as a diabetic. I watched police turning away a few shouting men and wandered across to take pictures, but decided there was really little of interest. I’d been planning to walk around through St James Park (as Whitehall was blocked) to Trafalgar Square and Whitehall to find the DFLA and Anti-fascists, but felt too tired, and decided to leave this to younger and fitter photographers who also have the advantage of not being as well-known to the thugs, and went home. 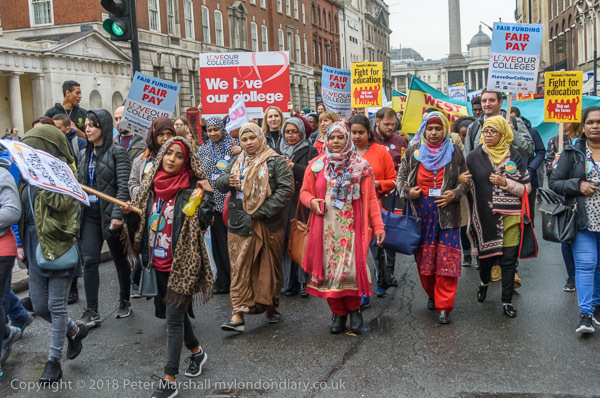 More pictures, including a number of the speakers, at Rally opposes Islamophobic DFLA on My London Diary. You are currently browsing the Re-photo blog archives for December, 2018.